Online legal services such as LegalShield help small businesses save money on their legal costs and get affordable help when they need it or even get incorporated. They also offer business owners peace of mind, safe in the knowledge that their legal work is being handled appropriately and that if anything unexpected should happen, they can call upon legal assistance. LegalShield is an online legal service that helps entrepreneurs with the legal side of setting up and offering ongoing legal support. This support can help in the case of an unexpected legal matter (for example, if someone is taking legal action against you or you need to issue a cease and desist notice) or as part of the ongoing operations of the business (such as help with taxes). LegalShield seems to offer the most comprehensive set of features at a great price point, with packages and plans suitable to businesses of different sizes and at different stages. Combined with the excellent user experience and innovative features, LegalShield seems the strongest competitor in the crowded online legal service market. As with RocketLawyer – one of their best-known competitors – LegalShield functions as a membership service which you can join at any time. Unusually though, LegalShield describes themselves as a law firm and membership gives you access to their legal team. LegalShield offers a generalized approach to online legal services while offering specialist packages for small businesses. While LegalShield does offer support for individuals with legal needs, this review focuses on their services for small businesses. Consultation with a local attorney – they can help you select the right business entity type, the best state filing, and make sure it’s set up properly on the first attempt. Business formation documents and filing – your attorney will create the relevant documentation and file it with the appropriate office on your behalf. A kit and unique business seal – this add-on includes an engraved binder to organize your business documents (far more valuable than it may sound) and a custom seal/embosser with your company name, year of formation and state of filing. As a standalone service, this would be valuable enough, however, LegalShield also provides a custom legal plan to protect your business once formed. As of 2019, the list of areas this protection covers is extensive. You also receive free reviews of documents up to 15 pages in length, a potentially valuable addition. While your business legal plan may be fairly extensive, it doesn’t preclude legal issues emerging either in your personal or professional life. However, LegalShield provides 25% off additional legal services whether personal or business related. It’s clear that LegalShield have worked to make their features extremely wide-ranging, and they claim that they’re the most comprehensive on the market. The user experience is elegantly streamlined, their site is great to navigate, and it’s easy to remain orientated. 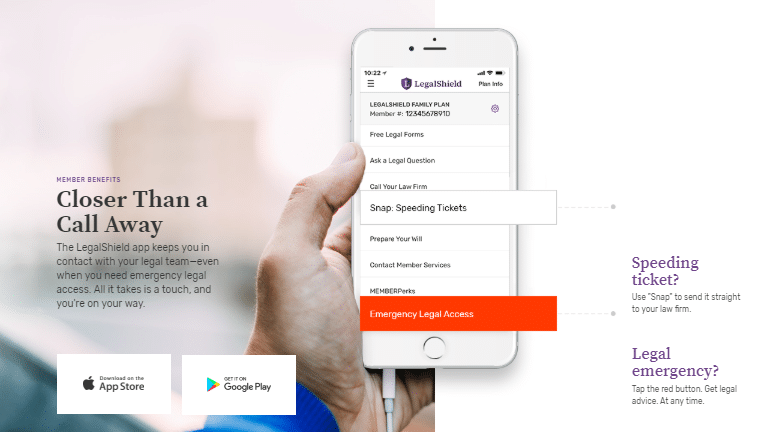 The 24/7 emergency support is also reassuring, as is the easy-to-use app for contacting your legal firm (which is how LegalShield refer to themselves) in an emergency. These different plans start at $39, $89, and $149 per month respectively. This means that as your business scales, your legal needs grow, and so will the amount you pay LegalShield. This also means that you’re not paying extra when you only have a half dozen employees for coverage suitable for a business of a hundred people. For the kind of coverage offered by LegalShield, $149 per month for a team of up to a hundred employees is quite affordable. You also get more for your money with the higher price. For example, both Small Biz 50 and Small Biz 100 come with trial defense services. The other features you receive scale by cost and size of business, so while a small business on the Small Biz 10 plan is entitled to 20 document reviews per year, a company with Small Biz 100 gets 40 document reviews. While we work to keep our information up-to-date, it’s always worth checking LegalShield’s website for their latest package and price combinations. If you’re in doubt about any aspects of LegalShield’s pricing, plans, or coverage, it’s best to contact them directly. LegalShield may be arguably the most comprehensive online legal service on the market, but before rushing into a decision it’s usually smart to consider your alternatives. 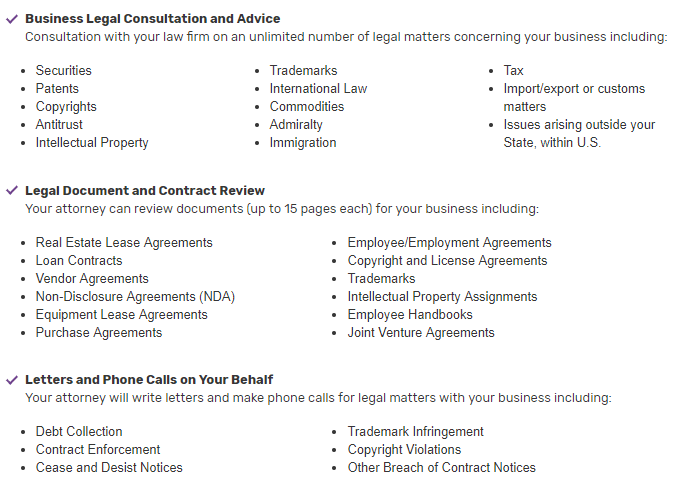 Both LegalZoom and RocketLawyer offer a range of features suitable both when setting up your business entity (like LLC filing or incorporation) and for when it’s up and running for either planned or unexpected legal help. The price points are broadly comparable and the services similar, although LegalShield edges out the competition when it comes to emergency access with their 24/7 emergency support combined with their app. For help legal help with business formation, you might also consider incfile.com who specialize in that area, although their range of expertise and the uniqueness of their offering decline a little once your business is established relative to their competitors. LegalShield seem to offer the most comprehensive set of features at a great price point, with packages and plans suitable to businesses of different sizes and at different stages. Combined with the excellent user experience and innovative features, LegalShield seems the strongest competitor in the crowded online legal service market.